Rhinitis refers to the inflammation of dog’s nose; sinusitis, meanwhile, refers to the inflammation of the nasal passages. Both conditions can cause a mucus discharge to develop, with prolonged inflammation, bacterial infections are common. Tip of the nose of dog should be wet if the dog is healthy. Dry nose is a sign of fever mainly. Wet nose facilitate the sense of smell of the dog. Therefore dog breeds that are good in sense of smell like dacshund have very wet nose while they are exploring. Certain dog breeds that have shorter noses (i.e. Pugs) may need a regular nasal cleaning, as they may have difficulties breathing if there is any matter stuck in the nose. There are a variety of symptoms which can be seen in dogs affected by rhinitis and sinusitis, including: sneezing, facial deformity, loss of appetite, nasal discharge (mucus, pus, cloudy, yellow, green, blood or smelly), decreased air flow (stuffy nose) in one or both nasal passages, reverse sneezing, nose licking due to discharge, swollen eyes. Some of the more common factors which can lead to rhinitis and sinusitis include: parasites, fungal disease, tooth root abscess, viral or bacterial infections, cancer, born abnormalities (e.g., cleft palate), presence of a foreign object within the nose, nasal polyps. Allergies - If there's a clear nasal discharge from your dog's nose that may be due to allergy. A dog's allergy symptoms don't stop at a runny nose; they can also include sneezing, coughing, itchiness, nosebleeds, and breathing problems. A blockage - A discharge from just one of your dog's nostrils is often a sign there's something stuck in that nostril, like a seed or blade of grass. Other signs include sneezing, pawing at the nose, and nosebleeds. Infection - A nose discharge of mucus or pus could indicate your dog has a bacterial, fungal, or viral infection. Additional signs of an infection might include a bad odor, a nosebleed, and coughing or choking resulting from postnasal drip. Polyps and tumors - Blood, pus, or mucus can be a sign that your dog has nasal polyps or nasal tumors. Other signs include noisy breathing or a bulge on one side of the nose. Nostril problems - Some dogs are just more prone to nasal discharge than others, including flat-faced breeds and dogs with soft, floppy nose cartilage. Noisy breathing can be another sign of nostril issues like these. 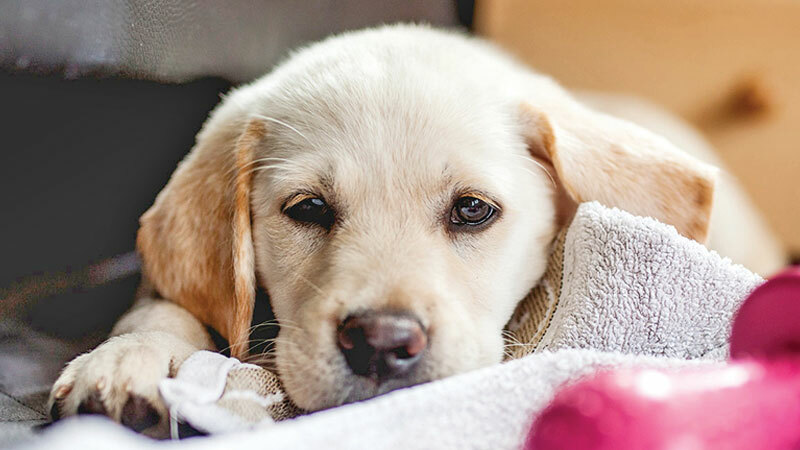 Distemper - Distemper can cause a sticky, yellow nose discharge in dogs, and while symptoms may vary, distemper can also cause fever, pneumonia, and twitching and convulsions. Rocky Mountain spotted fever - Nosebleeds can be one sign of this bacterial disease, which is transmitted by infected ticks. Other signs include high fever, lethargy, coughing, inflammation of the eyes, and pain. Cleft palate or fistula - If your dog has nose discharge after it eats, it could be the sign of a cleft palate or an oral-nasal fistula (a hole between the nose and mouth, sometimes caused by tooth decay, injury, infection, or surgery). A dental exam, blood work, imaging and a physical examination will be performed to determine what the underlying cause of the inflammation is, and to create a proper course of treatment. Nasal discharge that occurs in both nasal passages is often associated with viral or bacterial inflammation. When the discharge is only present in one nasal passage, it can suggest a fungal infection, cancer, a tooth root abscess, or a foreign object present in the nose. •Soothe your dog and keep it calm. •Cover the nostril that's bleeding with something absorbent. •Apply a cold compress (ice cubes) to the top of your dog's nose, between the eyes and nostrils. •Don't tilt your dog's head back to slow the blood, or put anything inside your dog's nostril. To examine your dog's nose, look for any signs of unusual discharge, including blood. Also keep an eye out for excessive dryness, a crusty nose, or one that's paler than normal. Then watch your dog's nose as it breathes. If the nostrils flare more than usual, that could be a sign of breathing problems. Always talk to your vet about your concerns. I would say a saline nasal spray is safe and may be used to help break up secretions. It may be offered as a symptomatic treatment that can be tried at home. In some cases, saline nasal sprays/ medicated nasal drops could be part of the treatment plan for dogs suffering from infections or other problems of the nose and the sinuses, to help loosen up the secretions that can clog a pet's nasal passages. Medicated nasal sprays, decongestants, corticosteroids, and similar products should never be used on dogs unless they are prescribed by a veterinarian. However, some inhaled medications may be beneficial to dogs, and a veterinarian may recommend a nebulization technique (similar to when a child inhales medication through a chamber or mask). The nasal spray /drops should be applied twice per day or as recommended by the vet. You should spray just a bit of the solution /put drops in each of the dog’s nostrils. You should make sure that the solution gets in the nose and not outside. You may also massage the area, so that the solution gets further in the nose. Wipe the excess solution with a towel or a tissue. The dog shouldn’t swallow the solution, as this may cause stomach upset or even vomiting. You should also pay attention not to get any solution in the dog’s eyes. The dog is likely to sneeze after the administration of the solution and this may mean that the solution is eliminated together with the sneeze. In this case, you should administer the saline drops again.